#97 – How do I look? Where would a bear get yarn in the arctic? Andrew still isn’t in school today, but I took the opportunity to draw again. This was inspired by the cold snap we seem to be having. My friend Katie pointed out to me that polar bears and penguins would live at opposing poles of the earth and would never interact. I guess that explains why the bear isn’t eating the birds. 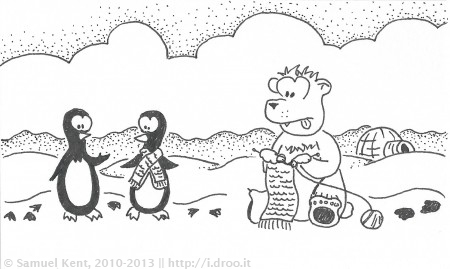 Author Samuel KentPosted on January 3, 2011 August 3, 2014 Categories Lunchbox DoodlesTags bears, critters, lunchbox doodles, penguins, Scarf and Nik-Nak, snow, TrumanLeave a comment on #97 – How do I look?